Fleur-de-lis Ceiling Tiles is rated 4.9 out of 5 by 9. Fleur-de-lis Ceiling Tiles feature a historic design coupled with smart functionality, which make them a top choice for glue-up and drop ceiling grid projects where the "tin ceiling" look is a must. Made from our Signature Series 0.030 in. thick vinyl plastic, they are thermoformed from molds based on original, hand-crafted metal ceiling tile designs and will add a decorative focal point sure to get people talking. 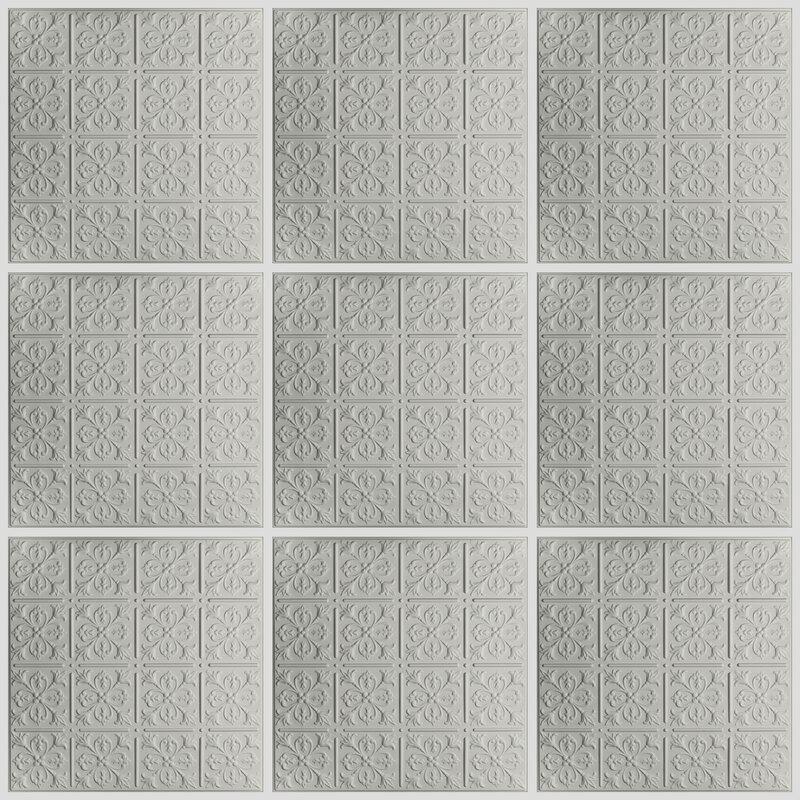 If you are installing your Fleur-de-lis ceiling tiles in a ceiling grid, copy/paste the following link into your browser to see written instructions and various installation videos: https://www.ceilume.com/how-to-install-drop-ceiling-tiles.cfm If you're gluing the Fleur-de-lis ceiling tiles directly to a ceiling, copy/paste this link instructions and videos: https://www.ceilume.com/how-to-install-glue-up-ceiling-tiles.cfm Feel free to give Ceilume a call at 800-557-0654 with any questions. Can these be installed over acoustic tile? Like many construction questions, the answer to your question is &quot;Sometimes&quot;. We do not recommend gluing any tile directly to an acoustic ceiling tile (typically concealed spine acoustic installations), there is a way to &quot;reface&quot; an old 2x2 mineral fiber tile by sliding the Fleur-de-lis in to a ceiling grid beneath the existing mineral fiber tile. This works best when used beneath an acoustic tile that sits flush in a ceiling grid. If the existing acoustic ceiling tile projects down below the grid, you will need to flip that old tile over so the tile sits flush in the grid before installing the Fleur-de-lis below it. No, this design is only available in the 24&quot; x 24&quot; size. Can these tiles be installed over a popcorn ceiling? No, Ceiling tiles cannot be installed directly to &ldquo;popcorn&rdquo; ceiling surfaces. It is recommended that the rough finish of the ceiling be removed, leaving the existing drywall exposed. Wood furring strips or a new layer of drywall can also be installed over the &ldquo;popcorn&rdquo; finish. The appropriate method of installation would then be based on the new installation surface. Can these tiles be painted and if so what kind of paint is needed? Most definitely! All of our ceiling tiles can be painted right out of the box or after you install them. A couple of notes: - Painting voids all fire ratings and approvals. - Always paint-match the actual products that you are planning on installing. - Do not use solvent-type thinners and cleaners. 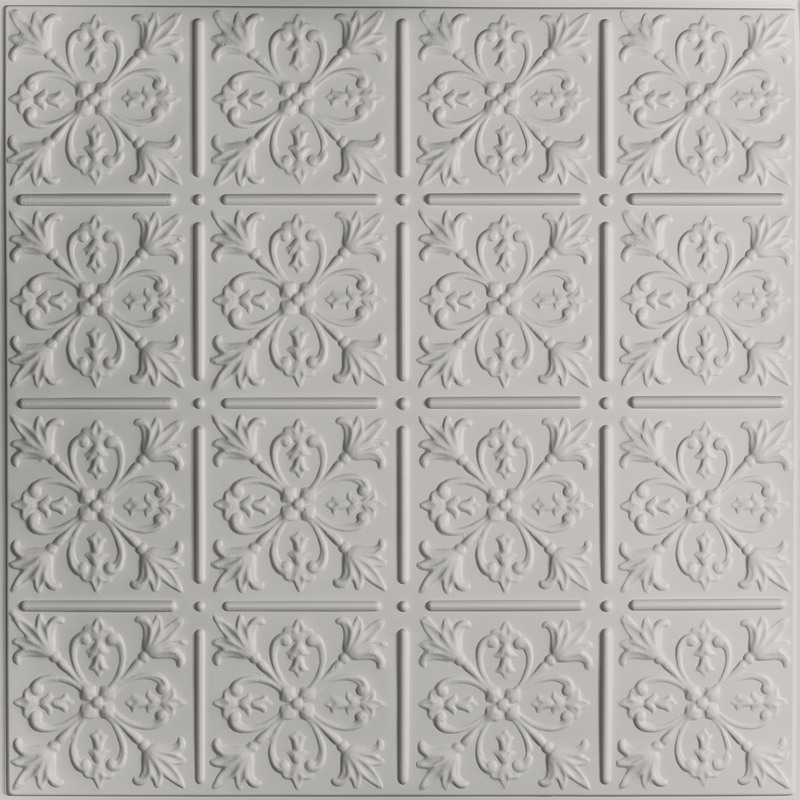 You can view and download the specifications, product data sheet, product safety sheet and much more on the product page for the Fleur-de-lis Ceiling Tile. Just scroll down a bit and click on the specification tab which is located right below the &quot;Related Products&quot; photos. You'll see a wealth of information and all of the downloadable files are at the very bottom of the Specifications section. Rated 5 out of 5 by Robert Galpin from Just thought that I would tell you about my experience with installing your product on my kitchen ceiling. To say the least it looks beautiful and have received many positive comments about it. The installation could not have been easier and working with the material was a pleasant surprise from cutting to installing. I would highly recommend this product for even the most novice remodeler. I will be using this product again in the near future. Rated 5 out of 5 by Linda Dalton from We ordered these tiles to cover an uneven ceiling in an old house - it covered the problem and looks so good and the installation went real easy for once. I give them a 5 and would recommend them highly. Rated 5 out of 5 by Joan Gramness from The ceiling went up easily and looks beautiful!!! And no more pesky stress crack in the ceiling! I would recommend this ceiling to anyone who wants a beautiful ceiling. So glad I found you. Rated 5 out of 5 by Donna Kirkwood from The ceiling looks great! My husband and I were able to install it easily in a couple of hours even with a few very tricky corners. We love it! Rated 5 out of 5 by Philip Segerstrom from The tiles were installed in our condominium lobby area and look very good. You have an excellent product. This is a nice building with units selling for 1.5 to 4.5 million and your product fits well. When were doing the walls in Italian plaster the workers painted all of the cross frames and then put a little contact cement on the old tiles to avoid any sagging.